Still reeling from the wonderful news that Collusion received an Honorable Mention from the Rainbow Awards, now I discover that Naked Tails joins Collusion in this honor. I'm one very happy author right now. The finalists won't be announced until October 1, and Honorable Mention doesn't mean the books made finalist, just that a judge gave them high marks. I'm happy dancing. Thank you, judges! 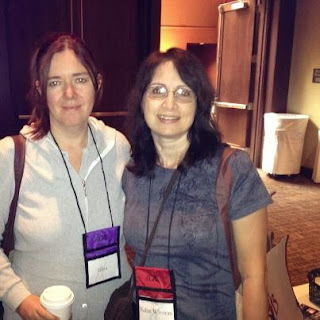 So far Elisa Rolle has posted two of five total posts, naming Honorable Mentions, and I'm fast adding more titles to my TBR list. Here's the second day's listing. I was at work with limited access to social media yesterday, so I'd like to thank everyone who Tweeted, Facebooked, e-mailed, texted, and otherwise let me know. The news definitely brightened up my workday. I am very pleased to announce that Collusion, the second installment of the Diversion series, has been given an honorable mention at the annual Rainbow Awards. This doesn't mean the book is a finalist, only that one of the judges took note, scoring between 36-40 of a possible 40. Elisa Rolle, creator of the Rainbow Awards, posted a list of honorable mentions yesterday, post one of five. She's determined to add more books to my massive TBR pile. Finalists will be announced October 1. Today at Mrs. Condit and Friends Read Books, they're holding a contest to win a copy of my upcoming novel, Corruption, the third installment in the Diversion series. "Eden Winters did an amazing job with this book. Even though Bo is the big deal in this book, it’s still told from Lucky’s point of view. You can feel his longing and fear that he’s going to lose the most important person in his life. The tension he experiences when a voice from his past reaches out to him and the utter chill that courses through his body when he hears it. She doesn’t give all the answers in this book. I mean, really, you gotta leave us wanting more, right? (Yes, damn it, I want more and I want it NOW!)" Corruption, available October 1 from your favorite online bookstores. "I loved this installment of the Diversion series, and it set us up perfectly for the fourth book. This is one story that is not to be missed. If you haven’t read the first two books, you could read this one and enjoy it but to get the full effect, I recommend reading the entire series. You will not be disappointed." Corruption, coming October 1 from your favorite online book stores. Today on The Novel Approach, as part of their Joyful Approach countdown to GRL, it's all about the Diversion series, staring former drug trafficker Richmond "Lucky" Lucklighter, aka Simon Harrison, and former Marine and recovering drug addict, Bo Schollenberger. As a bonus, there's a deleted scene from the soon-to-be-released third book in the Series, Corruption. What's that, you say? You haven't yet read the first two books? Never fear, TNA is also hosting a giveaway for ebook copies of the first two books, Diversion and Collusion. Hurry on over and get your name in the hat! Also, be sure to check out the other posts, featuring authors who will be attending next month's GRL in Atlanta. Woot! Less than a week remains until Corruption, the third installment in the Diversion series, and we're kicking off with a giveaway at Stumbling Over Chaos. Head on over, get your name in the hat for an ebook copy, and be sure to check out the linkety, Misadventures in Stock Photography, and stunning pictures of the lovely Mayhem and rascally Chaos. Thanks, Chris, pet parent extraordinaire, for hosting the contest. "...I had trouble putting it down when I started. I found myself staying up past my bed time, reading more with my first morning cup of coffee, reading even more during my breaks at work, and rushing home to finally finish reading this captivating story." 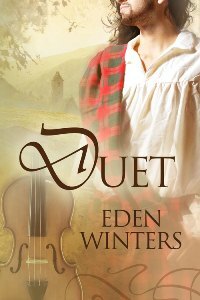 Find Duet (ON SALE NOW!) at Dreamspinner Press. Violinist and scholar Malcolm Byerly fled Kent in fear, seeking nothing more than a quiet post, eager minds to teach, and for no one to learn his secrets. He didn’t count on his charges’ English-hating barbarian of an older brother, or on red-and-green tartan concealing a kindred soul. A shared love of music breaks down the barriers between two worlds. Aillil’s father threatens their love, but a far more dangerous enemy tears them apart. They vanish into legend. Two centuries later, concert violinist Billy Byerly arrives at Castle Callaghan—and feels strangely at home. Legends speak of a Lost Laird who haunts the fortress in wait of his lover’s return. Billy doesn’t believe in legends, ghosts, or love that outlasts life. But the Lost Laird knows his own. 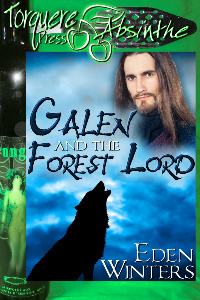 Tomorrow, September 4, from 6-7 a.m. CST, Torquere is giving away my novella Galen and the Forest Lord!